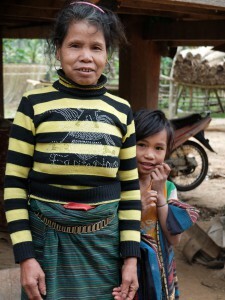 Laos has a maternal mortality rate worse than Afghanistan's and an infant mortality rate worse than Sudan's. 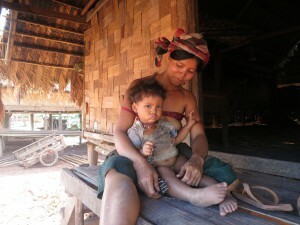 In the villages where we work, women often birth alone, without clean supplies. 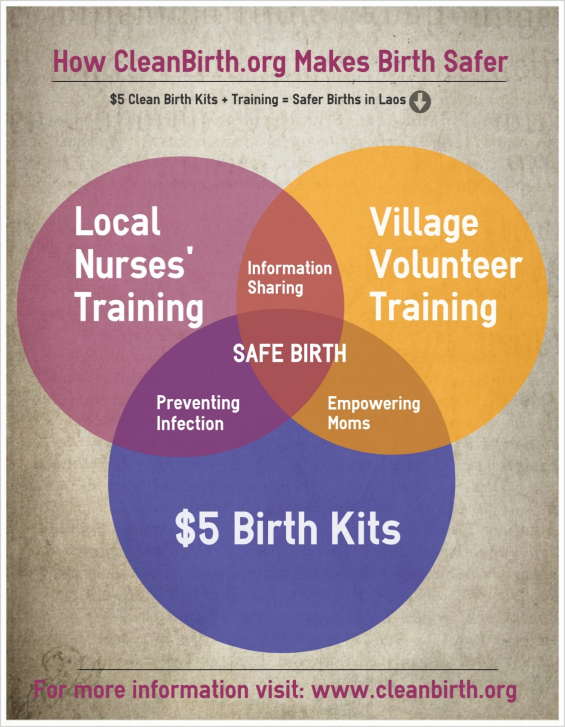 Clean Birth Kits ($5 each), supplies that promote hygienic birth and reduce the risk of infection and death. 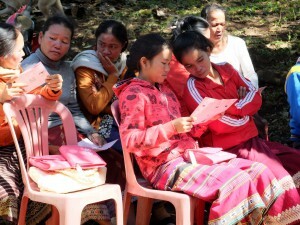 Village Volunteers who give mothers the kits, explain how to use them, and provide information about how to be safe during pregnancy and birth. Thanks in large part to 323 YOU who gave in 2013, many during during crowd funding last February, we were able to supply 2,000 birth kits and train 16 local nurses and 20 Village Volunteers in 2013.
an alliance with the Yale University School of Nursing to improve the trainings we offer. And, with Yale midwifery students, we plan to train at least 10 nurses and 25 volunteers in July 2014. The goal for this fundraiser is to raise the funds to train those 10 nurses, 25 volunteers and provide them with 500 AYZH Clean Birth Kits. 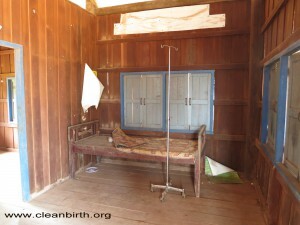 Please join our mission to make birth safer in Laos. For very little we can bring about big change. Please give whatever you can. Thank you! Max Zalota, Secretary. MBA Oxford University (UK), MS University of Michigan. Max works with the President to prepare the annual budget and present the budget to the board for approval. Further, he is our technology guru. Jenny Fouracre, Board Member, MA Boston University, BA Michigan State University. Jenny, public relations professional, is responsible for public relations strategy and communications plan. Shannon Lawton-O’Boyle, Board Member, LCCE, Doula (DONA), Certified Lactation Counselor, BS Purdue University. Shannon with deep roots in the birthing community, heads up efforts to promote our donation cards, via social media and through retailers. If we reach our total fundraising goal of $7,500 we will be able to train 10 nurses trained+ 25 Village Volunteers + 500 kits supplied. If we reach our tipping point of 4,000 we will be able to train 5 nurses, 15 Village Volunteers and provide 250 Clean Birth Kits. 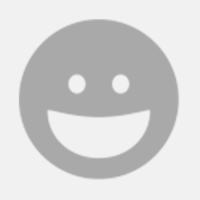 Thank your for your generous donation! Please help us spread the word about this campaign and share this campaign with your friends! *Rewards Note: Lao handicrafts and scarves will be distributed in August 2014. $5 give a mom a Clean Birth Kit and YOU get a shout out on our Facebook and Twitter Pages! $25 gives 5 moms Clean Birth Kits. YOU get the above *and* a cool CleanBirth.org fridge magnet! $50 trains a Village Volunteer for one-half day. YOU get the above *and* a special Mother's Day Card! $100 trains a Village Volunteer. YOU get the above *and* a Lao handicraft. $250 trains a Nurse. YOU get the above *and* small-sized, handmade Lao silk scarf. You will also be named as a Bronze Level Friend of CleanBirth.org on our website. $500 trains 2 Nurses. YOU get all $100 rewards *and* a medium-sized, handmade Lao silk scarf. You will also be named as a Silver Level Friend of CleanBirth.org on our website. $1000 trains a Nurse. YOU get the $100 rewards *and* a large-sized, handmade silk scarf from Laos. You will also be named as a Gold Level Friend of CleanBirth.org on our website.